This blog is part of a very rapid tour of what I’ve been up to over the last five years, only four years to go…. January was pretty much of a washout as I was moving from the house I had lived in since 1993 into a flat nearby. Moving meant that I also moved away from the recording studio I had built up over the last twenty years. Now having a studio in the house is one of the things that most musicians crave and, while I did make good use of it in both my music and writing work, now that mine is gone there are some thoughts that occur to be about how much of a good idea this is. The appeal is obvious; any time (night or day) you can pop down to the studio and put down an idea, you can record your next demo or single / album release without the expense of going to a commercial studio, you can even make it into an income stream by recording other musicians or ‘voice overs’. I did all these but not nearly as much as I expected I would. For a start, having it so near, so convenient, is a boon to procrastination. When you hire a commercial studio you have to prepare and work to a deadline which tends to concentrate the mind. Another advantage of going somewhere else is that you get another pair of ears. If you have to be an engineer, producer and musician all at the same time tends to get confusing. Each of these roles has a seperate set of criteria and trying to do them simultaneously means that you can do none of them well. Having a sound engineer / producer that you trust means that you can concentrate on the main task of doing a good performance without having to control the machinery. After going studioless I developed a great relationship with a local project studio which has not only increased the quality of the music I produce but also the quantity. Recording other musicians / bands in your studio also sounds like easy money, but it turns out that you are always on the wrong side of the glass, often trying to get the best out of inexperienced (let’s be charitable here) players. 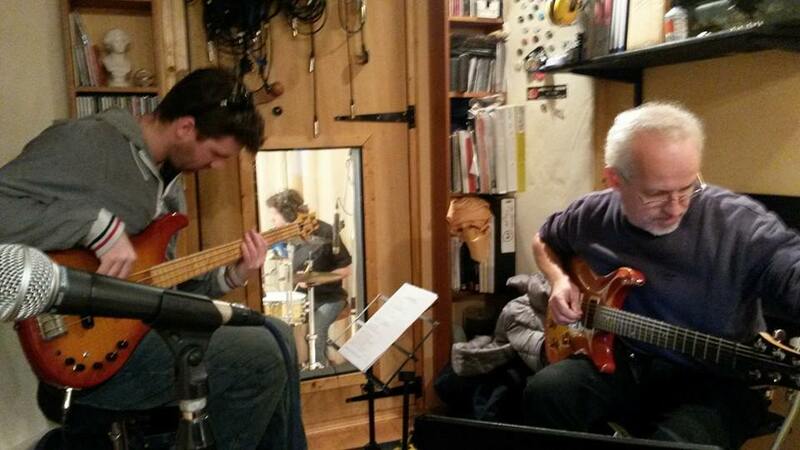 If your aim is to create your own music then the time spent is wasted and frustrating to boot. I’ve had some great musos in the studio as well as dire ones – like the bloke who wanted to use his recorded song as a seduction tool and wanted to come back into the studio every time he had a new paramour in mind to change the name of the girl in the song. And at the end of the day, do you really want a bunch of death metal players of dubious intent in your house? January is always pretty quiet for live music but in February things started moving again though I had a gig cancelled due to stormy weather taking out the power at the venue. 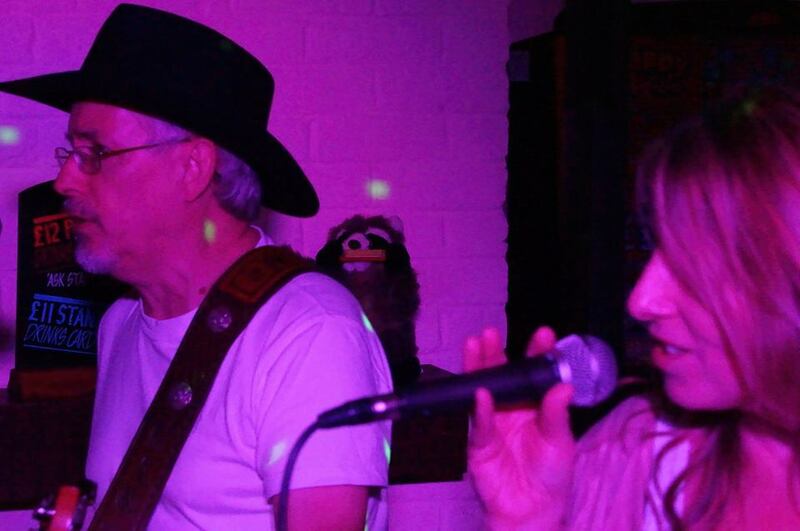 After knocking the covers band (Stencil) on the head we decided to give smaller venues a go with a duo doing a mix of country and pop songs with backing tracks to fill out the sound. 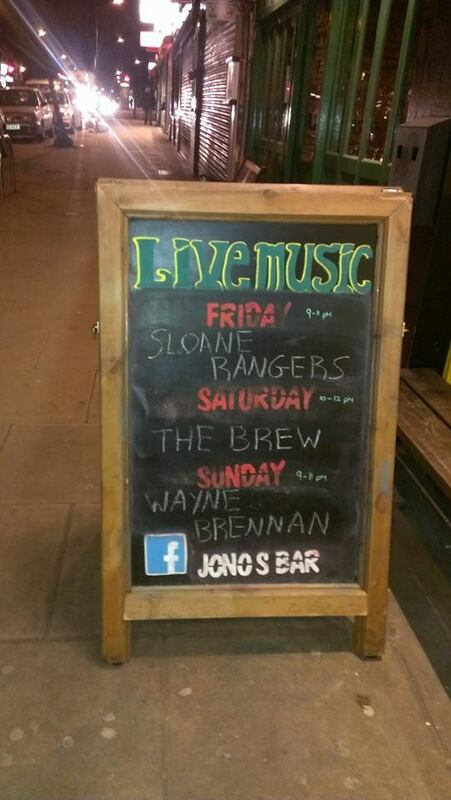 Our first outing was at Jono’s Bar somewhere in north London which went pretty well for a pub gig. I also decided to give BASCA (British Academy of Songwriters, Composers & Authors) a go to help push my songwriting and perhaps do a bit of networking. Towards the end of February I went to one of their events at their headquarters in London. The idea was that you would play some of your tracks to a panel from the music industry and they would give you an honest appraisal and advice. For me the whole exercise was something of a washout as it turned out the that the tracks were only shared with the other writers attending who selected one track to put before the panel. I was also called a ‘monkey’ by one of the other writers when I mentioned I was a working musician (she was a photographer BTW). Apparently my practical knowledge of music would sully the high art of writing a pop song! 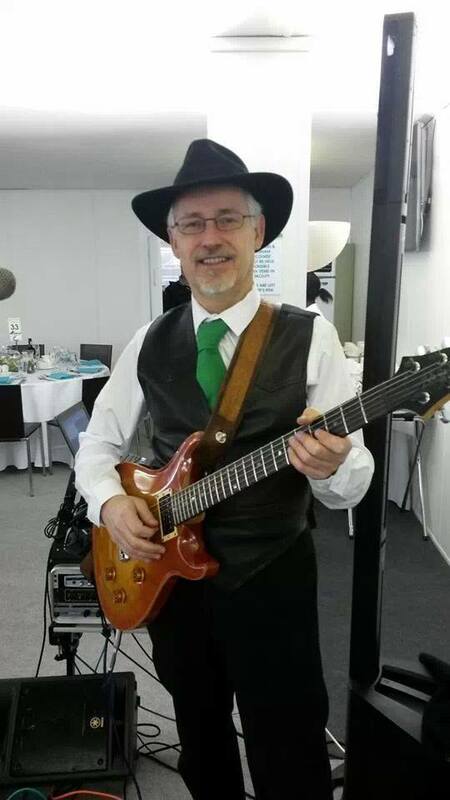 Spring brought Cheltenham Gold Cup Festival which we were booked for the fourth year running – doing a a mix of celtic, pop and country music. This is the second time we’ve done this as a duo and we decided to use backing tracks again for some of the sets again. Last year I did this using Windows Media Player on a little Samsung Netbook I have. In the intervening year I did some research and settled on Anasoft’s OnStagePlayer which is a dedicated Media Player extension that allows groups of backing tracks to be arranged in sets. As the software is controlled by ‘hot keys’ I purchased a double USB footswitch to control the software; starting and stopping the tracks and selecting the next one etc. 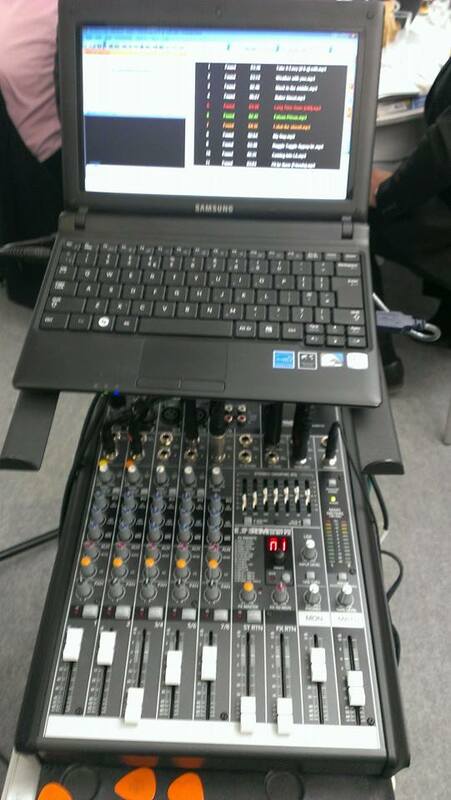 I also bought a little Mackie mixing desk with a USB input to keep the audio signal in the digital domain until it reached the link to the PA – a BOSE L1 Compact system. The gigs went down well but unfortunately I had a RTA (Road Traffic Accident) on the way home when a stupid driver ignored a Giveway sign on a country road and shot out in front of the van and we collided. Luckily no one was injured and I was able to get the damaged van home before it conked out completely. I was registered with the UK Musician’s Motoring and Accident Aftercare benefit which arranged a replacement hire vehicle while they negotiated with the other driver’s insurance company for the cost of repairing the van. The rest of spring was busy with Hoedown Band gigs including a secret gig in London for which we all had to sign a non-disclosure agreement! 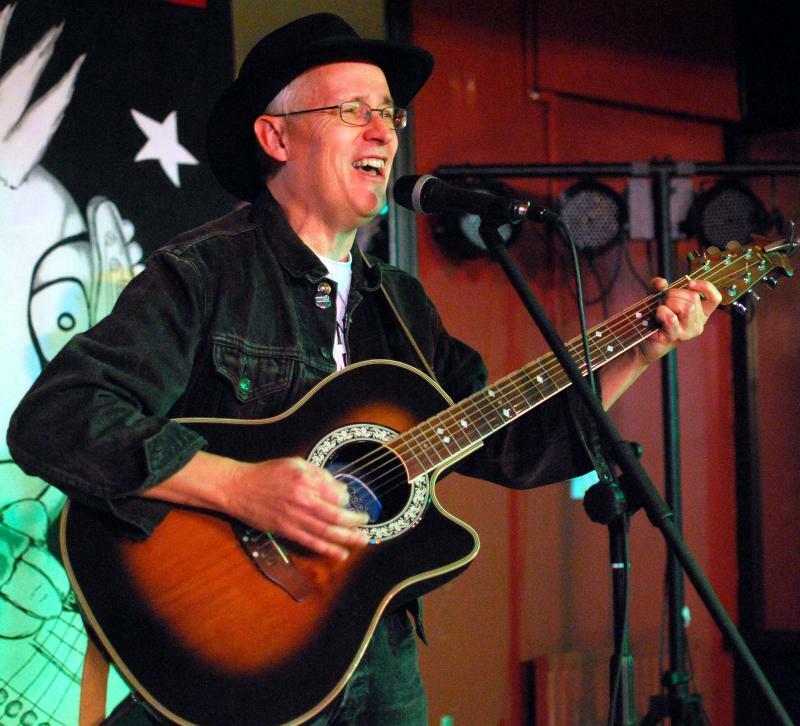 Other gigs included Hoedown playing at The White Hart in Alfreton, a large charity event in Stoke-on-Trent and acoustic duo gigs with Dawn Moore for Music in Hospitals. I also had to take a quick trip to Australia for family reasons. “Big up to the Hoedowns for a great day out. Odyssey of an outward journey, cliffhanger arrival. To Brian Heywood for doing most of the driving while jetlagged half to death. To Mike and Debbie for not being on Facebook. To Dawn Moore for inviting me and spraying my armpits in the dressing room (ferry terminal car park – we’re more of a piece of street theatre than a band at points). To the feral shanty band named after a mouthwash and their cute girl singer with the black knickers. To the two elderly ladies who came crashing down so spectacularly on the tarmac, to rise immediately and begin dancing again. And to the 18 year old Asian lad who served my exceptional breakfast kebab with extra chilli while fending off the attentions of three really fabulous drunk girls. All with two short sea voyages thrown in. 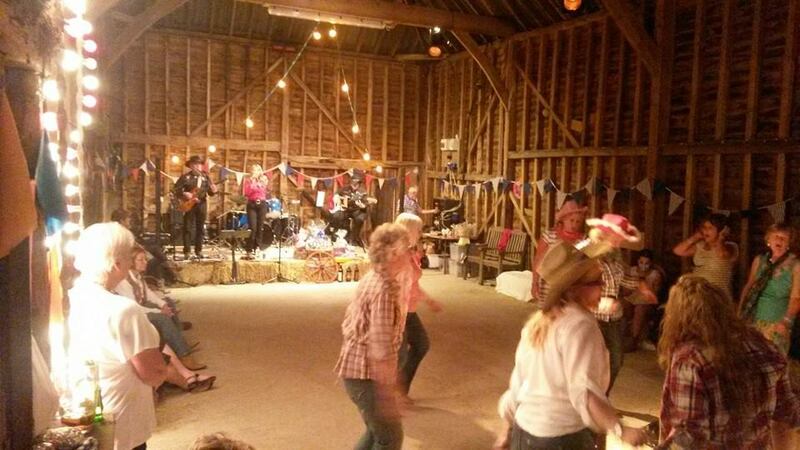 The rest of the year carried on being very busy for the Hoedown Band with highlights being a fundraising barn dance in aid of a primary school in Fishbourne, Invicta Barracks in Maidstone and another charity gig in Enfield. One unexpected surprize was meeting up with Anita – who was a lead singer in Rick Cristian’s Open Road at the same I was – at a gig at her school and a massive charity barndance for the National Farmers Union (NFU) which caused a traffic jam in Enfield (north London). I also did a solo gig for Luton promoter PDM at the Four Hourseshoes which stretched my audience engagement skills somewhat. 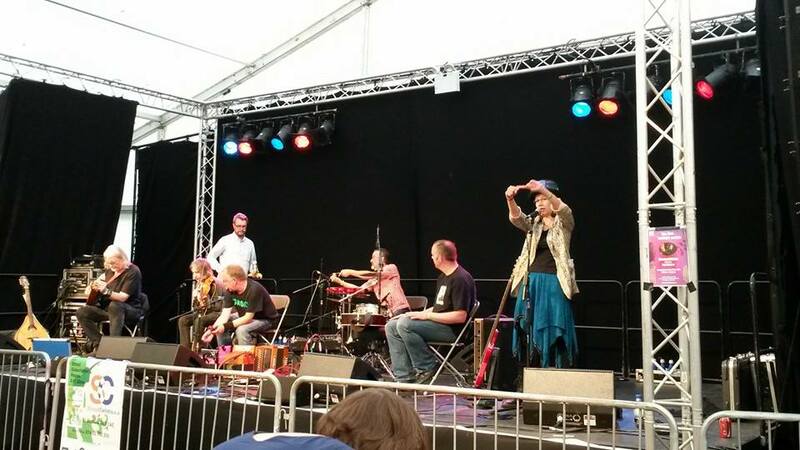 In August my youngest daughter called at the Towersey Folk Festival Dance tent with one of Simon Care’s ceilidh bands. Lisa has been going to barn dances – and festivals- since she was very young so it’s not surprising that she has a talent for this. It was great to be in the audience for once and have a bit of a dance! The following month the Hoedown played a rare public ‘pub gig’ at the Nags Head in Dunstable. This type of gig is really very odd and we don’t do them very often. People often consider this kind of gig the basis of live music scene but I’m not sure I entirely agree. While they can help young bands develop their performance skills, unless the pub puts some effort into the staging and advertising the event then it’s just a waste of time for both the band and the pub. There were some good music pubs in the area but random pubs putting on random gigs really don’t cut the mustard and really just keep the standards – and fees – down. This kind of gig also favours the hobby band with a large number of friends and relations (F&R’s) over professional bands so I guess that’s another reason why I’m not keen on this kind of gig. Ceilidh Band (renamed to The Barn Dance Band) after a run of 14 years. This was due to the popularity of the Hoedown Band and the difficulty of competing with hobby bands who charge very low fees – since it really is a form of entertainment to them – paid for by the day job. 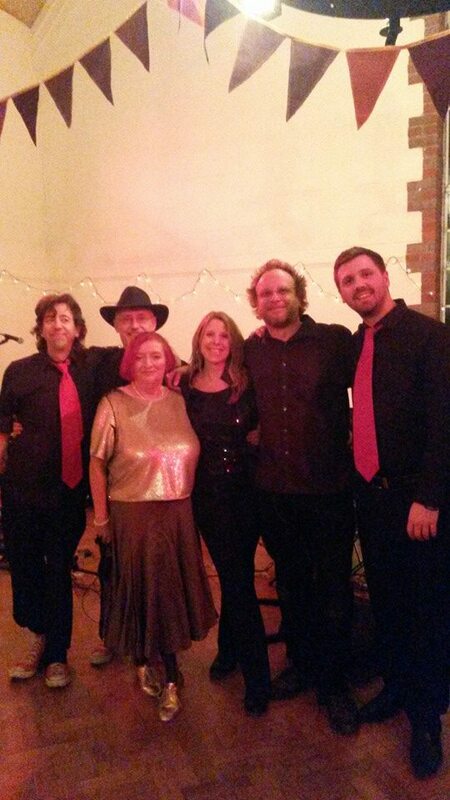 The last gig of the year was a NYE gig at the Lamb Inn in Burford and then home in less than an hour. After that we emptied the van, showered, did some final packing, then loaded our bags into a taxi and headed off to Heathrow for our flight to Melbourne. So goodbye 2014 full of highs and lows with 80 plus gigs and a new world ahead of us with an awesome start to 2015. See next the next installment for 2015 (only three years to go!). 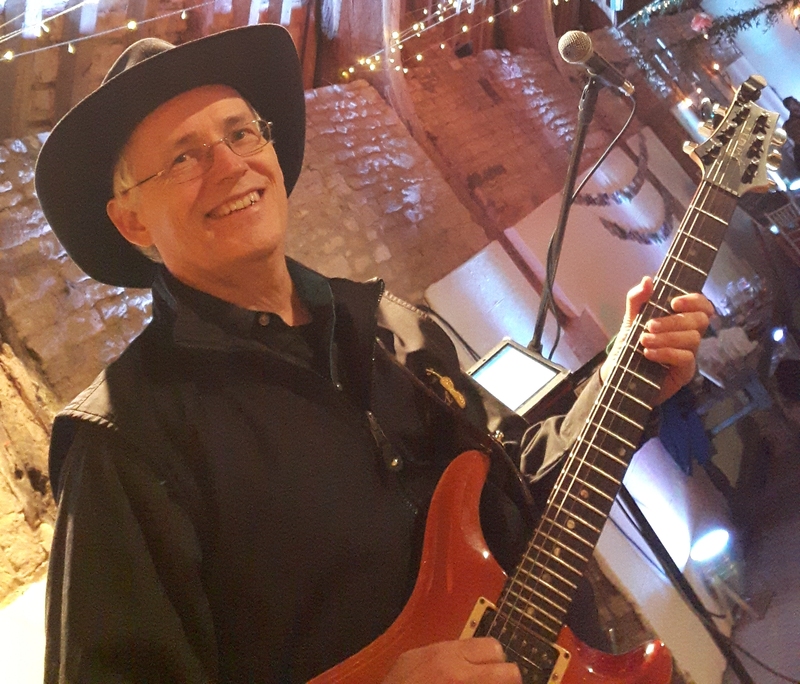 This entry was posted in Brian's Diary, Free-range Musician and tagged Brian Heywood, country music, entertainment, freerange muso, Hoedown Band, live music, Luton, music, Musicians' Union. Bookmark the permalink.